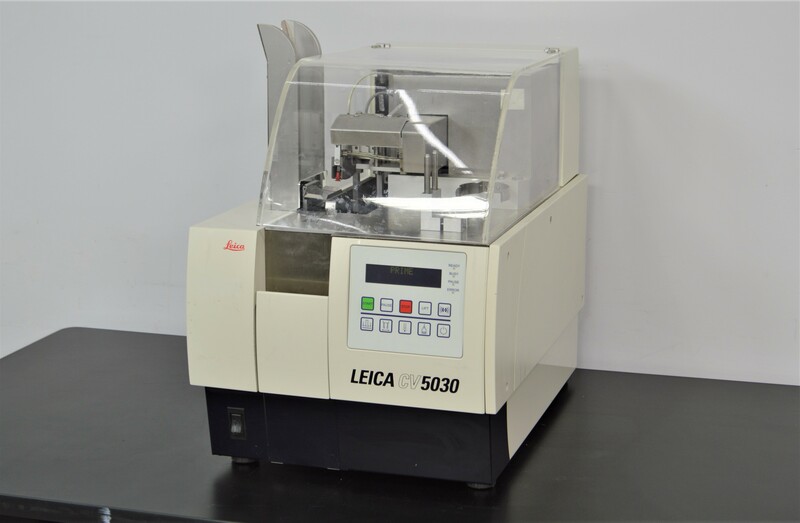 Leica CV5030 Fully Automated Glass Coverslipper Histology Cytology Monolayer . New Life Scientific, Inc.
Includes 90-Day Warranty. Passed Initialization. This Leica CV5030 coverslipper passed initialization and is in good cosmetic condition with some wear and staining from use. This coverslipper has a slide throughput of 1 slide in 9 seconds (approx. 400 slides per hour), an integrated fume extraction system, can use all common mounting media, including xylene-free varieties, and perform both wet and dry coverslipping. This Leica CV5030 was manufactured in 2003 and still has a considerable amount of life left in it. Our in-house technician inspected and initialized this Leica CV5030 coverslipper, confirming it to passed initialization. This coverslipper fully initialized and progressed to "PRIME" status. No further testing was done. This coverslipper needs a nozzle assembly, accessories and consumables to be operational. Sample types: Histology section, Cytology smears, Monolayer prep.